Origin and Habitat: Adenia ellenbeckii occurs in Ethiopia, Somalia, Kenya, Uganda and Tanzania. Altitude range: 30-1050(–1500) metres above sea level. Habitat and origin: Acacia-Commiphora bushland, rocky places, clayey soils; lava, granite, black cotton soil, red sandy soil or loam. Description: Adenia ellenbeckii is a monoecious shrub or herb up to about 1,5 m high with climbing or suberect shoots growing from an erect, more or less woody succulent stem arising from a tuberous rootstock. 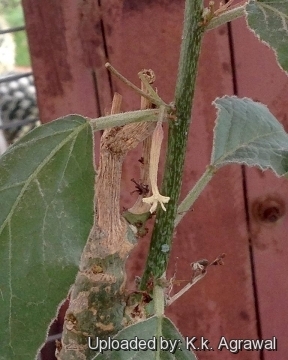 Whole plant usually pubescent, rarely subglabrous. 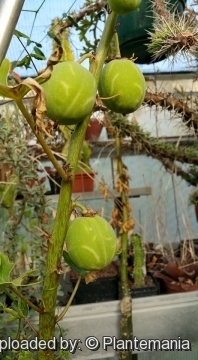 Stems: Shoots suberect or climbing or prostrate herbaceous 20–150 cm tall, growing from an erect succulent stem up to 30(–60) cm tall, from a tuberous rootstock. Sterile tendrils to 10 cm long, one per leaf or absent. Leaves: Entire to mostly deeply palmately 3–5(–7)-lobed or pinnatifid, mostly ovate in outline, cuneate to cordate at the base, 2–17 cm long 1.5–11 cm wide, with 3–5 main nerves from the base; margin variously dentate or dissected, pale green, not punctate beneath, mostly pubescent especially on the nerves. Lobes ovate or obovate to oblong, 1–8 cm long, top obtuse to acute. 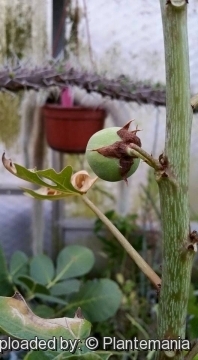 Petiole 1–7 cm long. Glands at base of blade 2, mostly sessile at each side of petiole. Glands on blade often present. Stipules triangular, dark brown dotted, 1–2.5 mm long. Juvenile leaf-forms sometimes have a peltate blade-base. Inflorescences: Sessile, 1–10-flowered in male plants, 1–3-flowered in female plants, without or with a tendril 2–10 cm long. Male flowers: Tubular, including stipe 20–50 mm long, 3–6 mm wide. Hypanthium including calyx tube 14–45 mm long; calyx-lobes 3–6 mm long, with woolly fringed edge. Petals lanceolate, 5–8(–11) mm long, fringed, inserted in calyx-tube. Corona absent or consisting of but a few hairs. Female flowers: Tubular, 12–35 mm long; pistil 4–10 mm long on short gynophore; styles united for 0–4 mm. 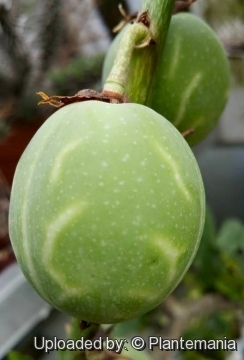 Fruit: 1 per inflorescence, subglobose, on short gynophore, 2–4.5(–5) cm in diam, leathery, rather fleshy inside. Seeds: 10–20 per capsule, ovate, 6.5–8 mm long. Related species: It is related to Adenia volkensii, but differing by the presence of tendrils, by the inflorescences which are always sessile, and by the narrow flowers in which the corona is lacking or almost lacking. 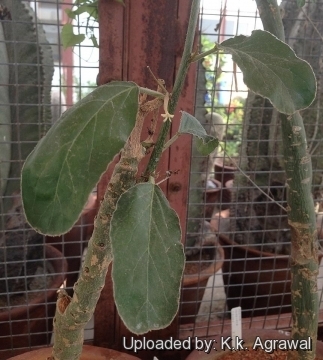 6) “Adenia ellenbeckii Harms” in: African Plants Database (version 3.4.0). Conservatoire et Jardin botaniques de la Ville de Genève and South African National Biodiversity Institute, Pretoria, "Retrieved [set month and year]", from <http://www.ville-ge.ch/musinfo/bd/cjb/africa/>. Cultivation and Propagation: Adenia ellenbeckii is an interesting addition to a collection, but rarely seen in cultivation. It can be grown outdoors in topical climates and forms an impenetrable shrub if not manicured. Manteinance: Repot every two years. It like pots with generous drain holes. 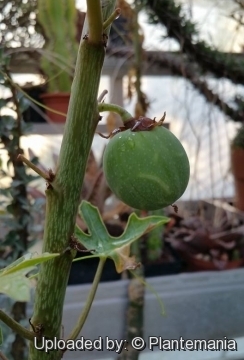 In the winter, the vining branches die back and should be cut back t to encourage branching, to maintain an attractive shape and to ensure caudex habit. If pruned and kept somewhat pot bound, it can be maintained at a manageable size, depending on what ''manageable size'' means to you. 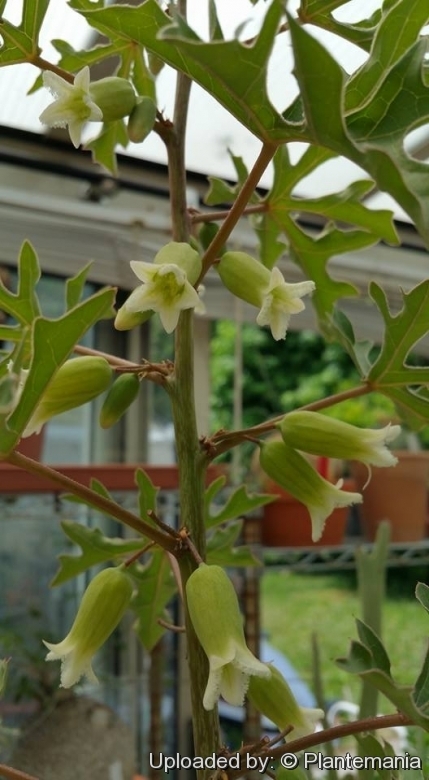 Uses: Adenia ellenbeckii is a poisonous plant and has medicinal properties. A decoction of its fruit is taken to treat wounds and fruit powder is applied to the wounds. It contains cytotoxic lectins. The juice of the fruit added to meat is used to poison hyenas. In Ethiopia the leaves are eaten as a vegetable.